There are only two tests of a life well lived L. Ron Hubbard once remarked: Did one do as one intended? And were people glad one lived? In testament to the first stands the full body of his life’s work, including the more than 12,000 writings and 3,000 tape-recorded lectures covering, among others, the subjects of philosophy, administration, art, education, drug rehabilitation, literacy, the mind and spirit. In evidence of the second are the hundreds of millions of individuals whose lives have been demonstrably bettered because he lived. They are the more than 28 million students now reading superlatively because of L. Ron Hubbard’s educational discoveries; they are the millions of men and women freed from substance abuse through L. Ron Hubbard’s breakthroughs in drug rehabilitation; they are the near 100 million who have been touched by his nonreligious moral code, The Way to Happiness; and they are the many millions more who hold his work to be the spiritual cornerstone of their lives. As a philosopher, L. Ron Hubbard cannot be simply categorized. If nothing else, his life was too varied, his influence too broad. There are tribesmen in Southern Africa, for example, who know L. Ron Hubbard the educator. Likewise, there are factory workers in Albania who know him for his administrative discoveries; children in China who know him only as the author of their moral code, and readers in a dozen languages who know him only for his novels. If one genuinely understood how individuals best function—their needs, aspirations and the source of their failings—one would naturally understand how groups of individuals best function. Such was the stance from which L. Ron Hubbard addressed the problems of administration: How we cooperate with others—not with administrative gimmicks or authoritarian decrees, but with a uniquely compassionate view of groups as individuals united in a common purpose. From that view, Mr. Hubbard spent more than three decades developing and codifying the administrative policies by which organizations function. These policies are derived from the fundamental laws governing all human behavior, and form a body of knowledge and technology upon which MGE’s training programs are based. The success of Mr. Hubbard’s administrative technology is such that more than 100,000 companies and organizations across the globe, spanning from industries and banks to hospitals and retail companies, are using these administrative principles to their benefit and prosperity. 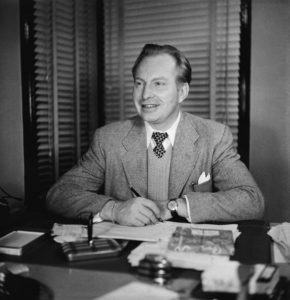 For more information about the life and works of L. Ron Hubbard, visit www.lronhubbard.org.